Enjoying in the Staff Mobility Week at Sapienza University is a privilege for two reasons: the university history and background and the city, Roma. Sapienza University founded in 1303, is the largest university in Europe and the second in the world after El Cairo. The numbers: 145.000 students, 4.500 teachers, 5.000 PAS, 11 colleges, 68 departments, 59 libraries, 20 museums, etc. From 23th to 28th, we met about 50 people from about 50 European universities. There were four areas in which the Sapienza showed interest months before starting the application process: internationalization, communication, libraries and information technology. The organization carried out different workshops according to the four groups mentioned. The week began with the classic official "welcome", in this case were held by Carlo D'Amore Musto, Director General; Luciano Saso, Rector's Delegate for International Mobility and Erasmus Institutional Coordinator; Antonella Cammisa, Head of the International Office and Marina Tesauro, Tor Vergata University. Then around for one hour we surprised two concerts, one in charge of MuSa Classica - Musica Sapienza - and other EtnoMuSa Laboratory, both impressive. In the first one played pieces by Johannes Brahms and in the second played songs of the mountains of Tuscany, Salento, Puglia, Calabria and Lazio, among others. Finally, the university offered a welcome cocktail in order to brotherhood over 50 participants. The working structure was organized daily on Plenary Sessions and specific workshops for each four areas and during the afternoons the organization offer interesting cultural activities. The Plenary Sessions focused on issues relating to "Management of Student mobility with Erasmus", "Youth employment: European opportunities", "IMOTION and Staff mobility management" and "Communication, Special events and Protocol". Commented by the librarians group was missing a session about libraries. After hearing the Plenary Sessions the group was divided into four mini-groups to work in a more specific area. Focusing on the group of libraries will be discussed the three workshops carry out. But before this, it is important to know some data about Sapienza library. Sapienza Libraries supports the development of its students, academics and the community at large with a wide range of services provided by 59 libraries, making it the largest university library system in Italy. Its vast historical collection has more than 3.700.000 volumes (2.5 ml. monographic volumes and 900.000 serials volumes), including 35.700 periodicals, over 30.000 ancient books, 150.000 rare books and numerous historical archives. Sapienza currently subscribes to over 10.000 online journals, hundreds of databases and a growing collection of e-books, available 24 hours a day from anywhere in the world via BIXY, our off campus access sign-in. Each Department has its own library, staffed by people whose skills meet the many needs of Sapienza students, professors and researchers. The library has a Discovery Sapienza to find an item and quickly access Sapienza's library resources regardless of type, format or location. 1. Sapienza Digital Library, collections and new services. Google Books is the most known digitization program. And like Complutense Library (BUC was the first library in Europe), Sapienza collaborate in Google project from 2012. 45 libraries are involved in this huge initiative. 28.000 volumes have been already scanned (4.000 volumes every 8 weeks). Google scan editions edited before 1.873. The library collaborates with Europeana. Many Sapienza University documents are provided by Europeana access. University Library is aggregating to Europeana during these years. 2. 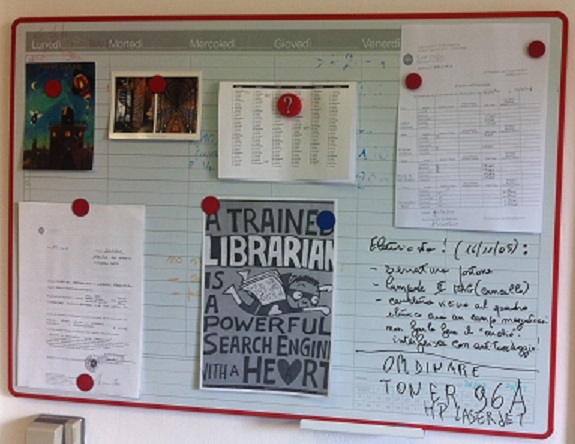 New competencies for Sapienza´s academic librarians. A cross country comparison. Not only Sapienza´s librarians need new competencies, the rapid changes in technology and associated shifts in research and scholarly communications are profoundly changing the role of libraries in the 21st century. Many libraries are adopting new services, such as assisting with the development of research data management plans, hosting collaborative virtual research environments, managing institutional repositories, and disseminating research outputs through open access mechanisms. We talked about it. 3. Electronic Resources and Scholarly Communication. In this session, mainly treated the Discovery Sapienza. This tool is a powerful search engine to find and access the most electronic resources available at the university. The search is performed on all electronic subscription journals in many databases, the catalogue of books in all the libraries of Wisdom (beta version upgrade). With the use of that tool the catalogue of the library, it has increased by 600% searches. Improved access to electronic resources. From the online catalogue you can access more than 1.7 million documents. Since he, too, can visit the electronic full text documents: over 20,000 journals, books, music materials, etc. Was surprising news of the library budget for these purposes, about 4 million. It looks that are advocating for technologies and access to documents online form. Thank users. The numbers in 2013: access by OPAC to 1.855.139 volumes and have 160.000 loans per year. This has been mainly the formal contact but the collaboration and communication with all the librarians have provided enrichment for all. The week was a good place to meet colleagues and discuss many areas of libraries. There can be no doubt that also has relations with all the Erasmus participants and with the organisers. Sapienza has organized the 5th Staff training week and each year they received more applications, this year near 150. I hope that at the University of Sapienza more editions were organized in the future and other staffs feel the experience.